There are as many ways to catch rainbows, as there are ideas from people who think them up. There are traditional baits, which do well and there are some real oddball techniques. Here are a few techniques that I’ve had a lot of luck with over the years. The set line is a perfectly motionless, quiet presentation that puts bait, be it trout worms (my favorite) to maggots, mealworms or powerbait in front of the trout. Its advantage is the quiet factor. Setlines should be placed a distance away from where you are actively fishing. Locate your setline around the deeper edges of weed beds or along points. Fish will frequent both locations and sooner or later it will produce. Trout will have all the opportunity in the world to swim by, circle, inspect and inhale your bait. 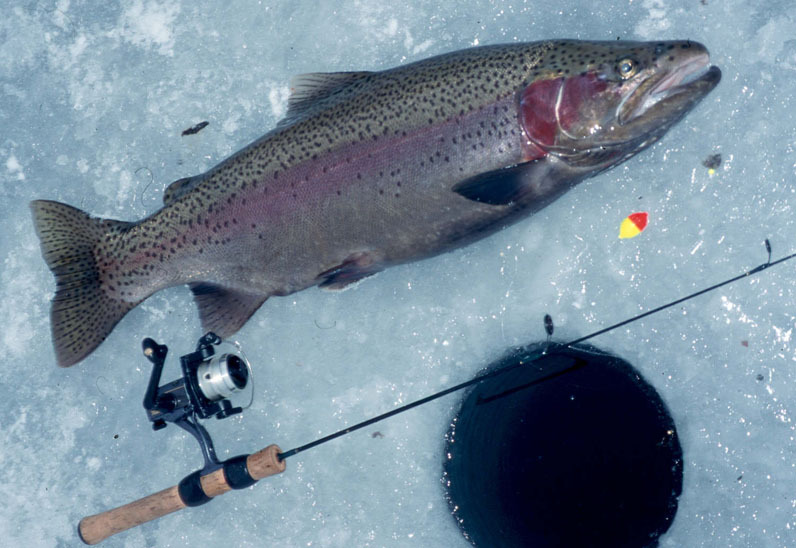 Use your regular summer trout fishing rod and reel for the setline application and prop the rod up so the tip rests a foot or so above the ice-fishing hole. You can even add a bell to signal a strike. The drag on the reel should be set light. A big trout will hit and run long before you have a chance to get to your rod. If the drags set right, it will pull line until you get there. If it’s set too heavy, the line will snap. If it’s set too heavy and it’s a short trout rod, the rod and reel will be pulled quickly and heartbreakingly down the hole. The jigging rod is another effective tool at catching trout. 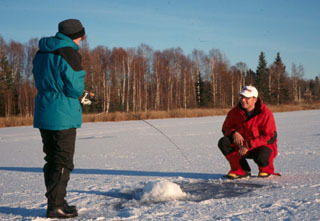 I like using the shorter ice fishing rods as jigging rods, simply because I’m closer to the ice fishing hole. Any number of hooks can be jigged, but here are my tops. My number one jigging presentation now has got to be the bead head nymph and strike indicator set up. I fish it much like a slip bobber and suspend the tiny bead headed fly a foot to two off the bottom. I like to fish over or near weeds with this presentation and I make a conscious effort to move everything slowly. Slow is how bugs under the water usually move in winter so slow is how I present my fly. I will slowly pull the fly up a couple inches, then let it sink back down allowing it to rest under the strike indicator. I strike at anything. The indicator starts to sink, I strike, the indicator does a funny hesitation, I strike. I think the indicator is doing something, I strike. Most times they will be trout and you’ll be surprised at how big a trout will take that tiny fly. My other preferred jigging presentation is a small lead headed jig slowly jigged. It can have a plastic curly tail or have marabou or other hair styles tails. They all catch fish. While I like flies over weeds, I like jigs over mud, sand or rock. I let the jig go right to the bottom and stir up a little debris. Trout are tacticians at sucking things off bottom, so don’t worry if the jig is on the bottom when a trout comes by. They can and will nose down and pick it up. If you want to combine the effectiveness of bait with the versatility of a jig, substitute a piece of dew worm for the curly tail. Now you have a presentation that looks, smells and tastes like the real McCoy. Fishing for trout in the winter is all about slowing things down. Do that and you’ll catch fish.